Ms. Tan is the Assistant Chief Executive (Development) of the Maritime and Port Authority of Singapore (MPA) who oversees developmental matters pertaining to Singapore as an International Maritime Centre, MPA's international ties and linkages, port policies and organisation-wide plans. She holds a degree in Business Administration from the National University of Singapore and a Diploma in Shipping from the Norad Fellowship in Oslo, Norway. Ms. Tan was previously Director (Corporate Group) in International Enterprise Singapore. 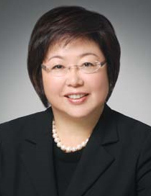 In 2008, Ms. Tan received the Lifetime Achievement Award at the Lloyd's List Asia Awards for her work in the development of Singapore as an International Maritime Centre. She was awarded the Public Administration Medal (Silver) in 1997 for her contributions to the development of the transport and logistics industry in Singapore. In August 2012, she attained the Public Administration Medal (Silver) (Bar) in recognition of her continued contribution in developing Singapore as an International Maritime Centre.